My study approach just isn't working! Hi all. I’ve been trying to learn Chinese for about 10 years now. Yes…10 years, and I’m still stuck in Elementary. It’s completely discouraging. I honestly don’t know what I’m doing wrong. I use Anki as a SRS and it works great for characters and vocabulary. The problem I have is with everything else - phrases, dialogues, grammar. It seems that the only way to revise these is to go through each of the old ChinesePod lessons I’ve studied before and redo the lesson, but the more lessons I get through, the more time I’m spending revising the old stuff so that I don’t forget them, than I am learning new things and moving forward. Each time I get to about 100 lessons the amount of time and effort it takes to constantly revise older lessons means that I get so frustrated I eventually give up, only to come back a few months later starting from scratch and falling into the same pattern. What am I doing wrong? I don’t know what to do next. I recommend visiting that guys channel and watching a good amount of his videos, should answer a lot of your questions in regard to studying methods. Another thing I would wonder, is are you attempting to use the language outside of chinesepod? And how so? Do you go out of your way to have conversations with chinese people? Do you watch t.v. shows and movies? Do you try to read books and newspapers? How much are you studying everyday? Because 10 years is a arbitrary number, it more boils down to hours spent with the language. I never use anki or any flashcards, I just read and listen and speak to the natives. I’ll share two strategies that have helped me. The first is, always move forward. I remember several months ago feeling (as you’ve described) burdened by how much I had to review, and I decided to revise my approach. Now, once I understand a podcast, text, video, or whatever, I move on (that is, for the most part–very occasionally I’ll review old material). If a phrase or grammar pattern is important enough to know, you’ll find it again and again in other contexts. You just have to have faith. And if you don’t find it again, then maybe that means you don’t need to learn it just yet. Second, your metric for success should be less about the what you know (the size of your vocabulary, the speed in which you can converse, your grammatical accuracy, etc. ), and more about what level of content you are comfortably able to digest. When I talk about “level of content,” I’m not just referring to ChinesePod’s levels, but outside content as well: news articles on Chairman’s Bao, graded readers that you can buy on Amazon, children’s shows you can watch on YouTube. To borrow gaming terminology, once you “unlock” the ability to digest higher level material, then further progress will suddenly become easier. If your goal is to speak in Chinese one day, you can watch Elementary ChinesePod lessons forever and you’ll never be able to attain that goal. But if you are able to “unlock” the ability to understand the Intermediate lessons, then you suddenly gain access to a much higher caliber tool for learning. Then as you listen to more and more Intermediate lessons, your skills will accelerate at a much faster pace than if you devoted the same amount of time to listening to Elementary lessons. Then if you unlock Upper Intermediate, suddenly fluent conversation comes within reach. It’s the same with reading. You’ll never be able to read native books and articles if you study the characters in isolation, or if you only read exercise material. But if you unlock the ability to read graded readers, then your reading ability will start to accelerate. And the great thing about graded readers is that they’re graded–they step up in difficulty just like ChinesePod lessons. Unlocking the ability to digest higher level content also acts as a bulwark against quitting, because frankly, higher level content is more interesting. If I only listened to Elementary lessons, I probably would have quit by now. I think it’s impressive that you’ve lasted as long as you have–it speaks well to your perseverance. But the Intermediate and Upper Intermediate lessons are more fun. And reading graded readers are fun, as is watching Mandarin-dubbed Peppa Pig on YouTube (even though it’s a show for kids). Now that learning Chinese is more fun, I am less motivated to quit, and more motivated to continue reaching for even higher levels. And hopefully one day, I’ll be reading and watching content in Chinese that I would normally read and watch in English. Of course, although higher level content will accelerate your progress, you still have to make some progress in order to “unlock” it in the first place. It’s like that old phrase, it takes money to make money. So if you’re stuck in Elementary, how do you get to the point where you can start studying Intermediate? First off, I’m totally impressed you’ve been studying for 10 years! That’s awesome. Sounds very frustrating at the moment though. I guess one big question would be: what is your main goal with learning Chinese? Day to day conversations? Specific professional vocab? Reading, writing? Keeping focused on that and doing stuff that’s interesting to you in probably the most important. If you really want to speak (which seems to be the case for most people) having conversations with Chinese speakers is probably the most important thing, however you can. If you’re not in China - online, with friends, or with conversation partners or a tutor in your area. As awesome as ChinesePod is it’s just not the same as talking with someone. I’ve also been using the Pimsleur CDs (from my local library) which I’ve found super helpful with speaking and listening. At least for me one the most helpful things is hearing the same words and phrases in different contexts. I’m a beginner - but for me reading something in my textbook, talking about it with my tutor, doing a lesson on the same topic in ChinesePod and listening to the Pimsleur CDs (though you can’t pick the topic) means that I hear the same things over and over again in different contexts, which makes it much easier for me to remember. I have a really hard time learning from just one source. Anyways, I hope that is at least somewhat helpful. Best of luck with your studying! Very good advice given by everyone so far. Here’s my 2 cents’ worth. My own story is not dissimilar to yours in that I’ve made countless attempts to learn Chinese, never getting beyond beginner level. What has allowed me to advance a lot in the last 10 months was coming across Benny Lewis’ Fluent in 3 months website, where I learned about a)ChinesePod (yea!!!) and b) the importance of taking the plunge in speaking the foreign language you’re learning. So following Benny’s advice, I went to www.italki.com and found myself a Chinese language buddy, who wants to learn English. We try to speak 2xweek for an hour each time, 50/50 Chinese/English. I have the way better side of the deal as his English is pretty good and he can explain a lot of things about the language and China. My spoken Chinese is still very faltering but practising speaking stuff I’m learning on ChinesePod is invaluable in anchoring both vocab and basic sentence structures. Be warned that it is painful at first as you struggle to string sentences together but it’s really worth it. Be warned also that you may have to try out several buddies before finding a partner you fit with. I got lucky with my first buddy. Thanks all, some great suggestions there which I’m very grateful for. How would I go about finding a suitable TV series to begin viewing? I wouldn’t know where to start unfortunately, but would like to give it a go. If anyone has suggestions on how to find graded readers that would also be very useful. 10 years is a long time…how many hours per week are you studying Chinese? I’ve been learning for almost 2years and some intermediate lessons are too easy for me now. When it comes to language learning or any other skill, it’s not so important how long you’ve been learning but how much time you devote to learning. I would highly advise having 1 on 1 lessons with native speakers, either through this website or other resources such as iTalki which I use. It’s not only motivating to be able to speak with natives it will help massively with your progress. Other than that, I’ve recently used Viki to watch chinese language TV shows and series, with English subtitles. This has helped improve my listening skills a LOT. Some of the shows I watch on YouTube are A Bite of China, Dad Where are We Going?, and if you are willing to watch children’s programming, Peppa Pig (the last two of these have both Chinese and English versions). Peppa Pig probably has the most accessible vocabulary. For graded readers, the two best series in my opinion are Mandarin Companion and Chinese Breeze. Just search for them on Amazon. You’ll probably want to start at level 1 (300 characters I think). Here’s a series I like a lot, the book was originally written in English and is really good by Lin Yu Tang. And who doesn’t love Vicky Wei Zhao? And I’ve been working through the defrances readers which are old but really good, especially for the people who want that diplomat/business language and traditional characters. Psamet has some great advice there. Pushing forward is essential. And the word, ‘Unlock,’ is such an accurate word he’s used. You simply need to keep listening to the MP3 again and again and again, trying to speak along with it, then reading, and re-reading the text. Even if it takes ten days or more to really get it. Just push along. And yes, leaving older lessons you’ve learned behind really is key. I used to think that I had to keep it all in my head, from every lesson I’d ever learned. That approach never moved me along. The times I’ve made the most advancement has been the times I’ve consistently just moved on, and then moved on again, and again. Reviewing is important, but it can also be a hinderence at times. Language and other subjects are not learned in the same way. You don’t need to too often look behind you. I don’t understand how so many people is going in italki, when I’m seeing the price, it’s just wtf. After I didn’t tried a chinese lesson… could be because i prefer the facetoface. If it’s just for chatting, I really prefer hellotalk. Glad you are enjoying the series, Viki has lots of great content from all around the world. I’m going to add my two cents here too. Everyone has given good resources and advise so far. The most valuable element I have in my studies at this point is that I have developed a huge circle of native Mandarin speaking friends. Now, I lived in LA for 15 years and now San Francisco for the past 6 months and I must say both cities have a higher volume of native Mandarin speakers than most others at least here in America. But even having one friend can change your entire study. Even mentoring a Chinese student at your local university is a great option. Many Chinese people here studying are also here to learn more about American culture and develop American friendships. This will help with not only learning Mandarin, but Chinese culture and add a quality friend to your life! First of all, there is no substitute for hard work, and after ten years of studying, I am certain you have accomplished that tenfold (no pun intended). I hate to be the one to break the news to you, but chinesepod. com is not the beginning and the end of learning Putonghua. Don’t get me wrong, chinesepod is a great supplementary tool for learning, but that’s all it is, a supplementary tool. I would also like to point out to you that although studying, practicing, etc., is both necessary and important for learning any skill, at some point in time, you have to apply what you have learned in a real situation. In order to speak a language you must actually speak to someone about something or anything: the weather, sports, your family, etc. Finally, whatever you do, don’t get frustrated with yourself. Keep studying but with a different, almost insouciant attitude. You’ve got nothing to lose and everything to gain. Have some fun with the language you study (this might sound dumb but whenever I receive a robo-call from a telemarketer I say "喂，你好！你是谁？喂，你听不到吗？你会说中文吗？They hang up immediately). Late to the party on this one but I am doing a 90 challenge for speaking Mandarin. I have found most helpful is short chats on 15-30 minutes. This way I can keep focused on speaking intensively for this short time. About anything and everything. Any correction or words dont know try and find the solution in Chinese. No English. For 15 mins this is possible. 2 of these a day for a month and you are speaking already. Fluent in 3 Months? Watch me as I learn to speak Mandarin Chinese in 90 days. 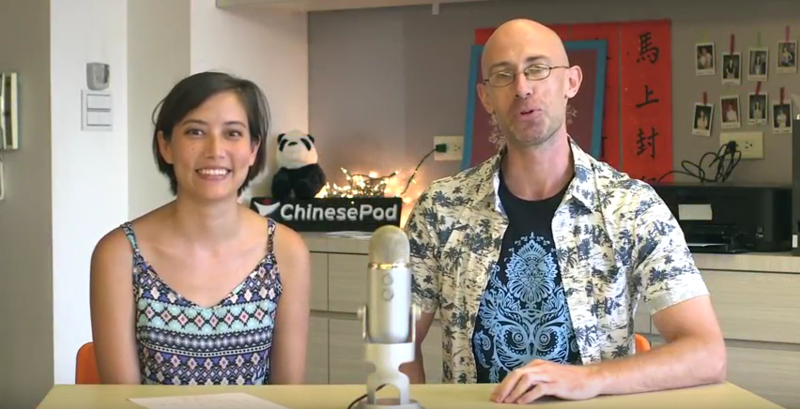 Watch me talk with Fiona Tan from Chinese Pod as I struggle through week 1. Get some partners and get talking ASAP.